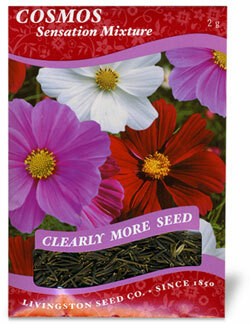 The Cosmos Sensation Mixture adds color to any garden with its shades of white, rose, pink and crimson. The 3-4" blossoms with feathery foliage grow rapidly. These easy-to-grow, drought resistant flowers will attract butterflies. Garden Tip: Prior to planting, cultivate soil to a depth of 1-2" and rake to remove debris. After seed is sown, watering should begin immediately. Water lightly and frequently to keep the seed bed moist.